The Puerto Rico State Elections Commissions has released a draft ballot for status referendum to be held on June 11, 2017. 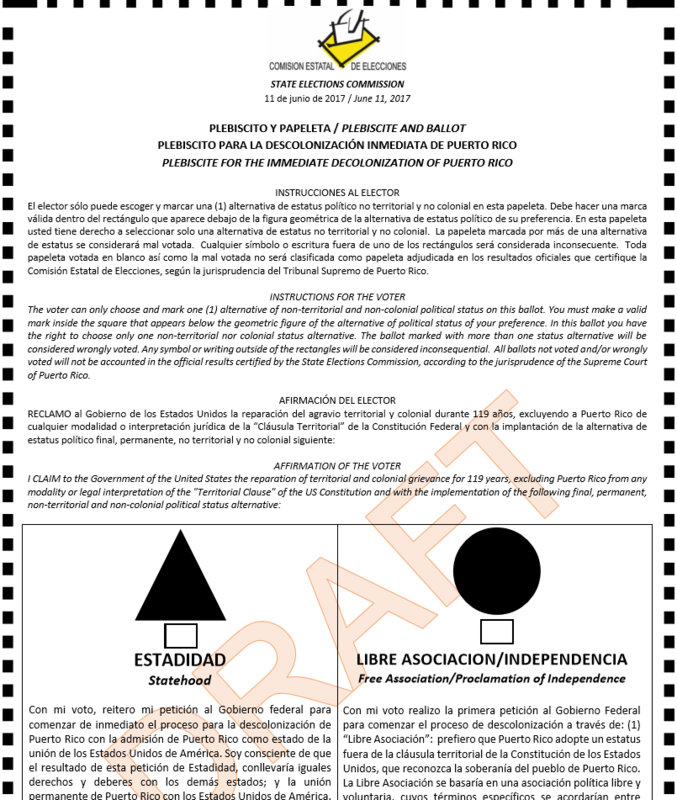 The next section of the ballot is the “Affirmation of the Voter” which recognizes Puerto Rico’s “territorial and colonial grievance for 119 years,” and positions the voter to select one of two “final, permanent, non-territorial and non-colonial political status alternative(s)” outside of the realm of the U.S. Constitution’s Territorial Clause: statehood or independence/free association. With my vote, I make the initial request to the Federal Government to begin the process of the decolonization through: (1) Free Association: Puerto Rico should adopt a status outside of the Territory Clause of the Constitution of the United States that recognizes the sovereignty of the People of Puerto Rico. The Free Association would be based on a free and voluntary political association, the specific terms of which shall be agreed upon between the United States and Puerto Rico as sovereign nations. Such agreement would provide the scope of the jurisdictional powers that the People of Puerto Rico agree to confer to the United States and retain all other jurisdictional powers and authorities. Under this option the American citizenship would be subject to negotiation with the United States Government; (2) Proclamation of Independence, I demand that the United States Government, in the exercise of its power to dispose of territory, recognize the national sovereignty of Puerto Rico as a completely independent nation and that the United States Congress enact the necessary legislation to initiate the negotiation and transition to the independent nation of Puerto Rico. My vote for Independence also represents my claim to the rights, duties, powers, and prerogatives of independent and democratic republics, my support of Puerto Rican citizenship, and a “Treaty of Friendship and Cooperation” between Puerto Rico and the United States after the transition process. If this option should win the vote, there will be a further vote later in 2017 on whether Puerto Rico should negotiate a Compact of Free Association or a Treaty of Friendship and Cooperation. Under a 2014 law, the U.S. Department of Justice has a responsibility to find “that the voter education materials, plebiscite ballot, and related materials are not incompatible with the Constitution and laws and policies of the United States,” but has not yet done so. I could see a scenario where the Dept of Justice NEVER BOTHERS TO VERYFY THE STATUS OPTIONS. If the GOP opposes statehood, they’re backed into a corner, since statehood will likely win. But by never certifying the ballot ‘ s constitutional merits (and it IS constitutional) the Congress gets an excuse to ignore the results & the PPD/PDP gets,and reprieve for their colony status! Either way, getting out from under direct control of the US Congress HAS to be a good thing. I am hoping you guys choose Statehood, because I have always believed the United States is stronger with you, than we would be without. Also, my wife and I are looking for retirement options. Just saying.